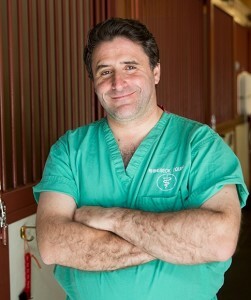 Dr. Abuja grew up in Spain and went to Veterinary School in Madrid (Universidad Complutense de Madrid). After earning his doctorate, he completed an internship in Belgium (Dierenkliniek de Morette) and then worked in equine referral hospitals in Madrid (Spain) and Sharjah (United Arab Emirates). Following a surgical internship and residency at Tufts University, he worked in private practice in New York and Virginia. In 2013 he became board certified in large animal surgery and is currently seeking board certification in Sports Medicine and Rehabilitation. Dr. Abuja’s main areas of research interest are minimally invasive surgical techniques and surgical implants. Dr. Abuja is available for outpatient appointments, elective surgeries and surgical and medical emergencies at the hospital. He also performs prepurchase exams, lameness evaluations, and surgical consultations. He enjoys the challenges of lameness diagnosis, sports medicine and multiple types of imaging. Dr. Abuja is married to Dr. Leah Steinberg, who is also a veterinarian, and they have three small children. Things that Dr. Abuja enjoys include spending time with family and friends, traveling, and music. Ambulatory and hospital emergency service is provided 24 hours a day. "Dr. Sotela is fantastic and has always been incredibly kind and patient with my mare, Mira. In May, Mira had to have surgery at the clinic for a soft tissue sequestrum. Dr Gus and the staff were wonderful to deal with." "We love Rhinebeck Equine and their vets and staff. They've been our equine vets for about 30 years and we love working with them." "Amazing facility with awesome staff. My friend had a horse who needed surgery and they were awesome the entire time. We hung out in their waiting room. Staff was friendly and talkative, and let us play with their dog. Dr. Gus is a great surgeon!"